If you thought bad posture while sitting was a problem, it seems getting older just adds to the issue. We’ll show you new research that shows that age related changes occur in your posture, and provide simple steps to keep your spine healthy and pain free. A study in the journal Spine just found that age related spinal degeneration reduces the low back curve. Normally, we all have a natural curve in our low back. This is designed in such a way as to balance out the stresses our spine goes through. The curve also doesn’t stay in one angle. It actually changes from a sitting to a standing position. First of all, don’t get scared when we talk about ‘spinal degeneration’. This is a natural process that occurs in the majority of us. There is really no correlation between back pain and the amount of ‘degeneration’ your back has. However, for those of us that sit all day, we tend to slouch and decrease that natural curve in our spine. Staying in this static position over time will eventually lead to pain. One of the best ways to prevent back pain from sitting too long is to get up every hour and walk around. In healthy people, the curve increases as you stand. This allows you to break up all that slouched sitting. It keeps your spine moving and healthy. However, from the recent research, it appears that aging changes tend to reduce the curve. If you’re sitting in a slouched position all day, AND having a reduced curve from aging changes, that’s going to increase your chances of adding more stress to your spine. You can perform yoga extension exercises. Remember, our spine is flexed forward all day if we’re sitting in a slouched position all day. We need to offset this by exercising our spine in the opposite direction. You can perform this exercise once a day. The older you are, the more you need to do this. I recommend once in the morning and once at night. Hold the position for as long as you’re comfortable. There isn’t any specific time limit or number of repetitions. You’ll be able to judge after doing this for a week. You may also want to do this exercise standing. After every 1 hour of sitting, simply stand and extend your back. This keeps your spine mobile and healthy. Combine back traction, strengthening and muscle knot relief. Over the last 20 years, I’ve discovered that proper spinal health involves three components. One is gentle back traction to allow you to practice keeping your spine in a normal curve. This position gently tractions your back out at the same time. However, you’ll also need to strengthen the muscles around the low and middle back. This can be done through weight training at the gym or using elastic resistance bands at home. Finally, the majority of pain is not caused by ‘degeneration’, but from simple muscle knots. These are called trigger points. To learn more about trigger points, you can go to our ‘beginner’s guide to trigger points‘. The key is to find these knots, press into them and move on to the next. 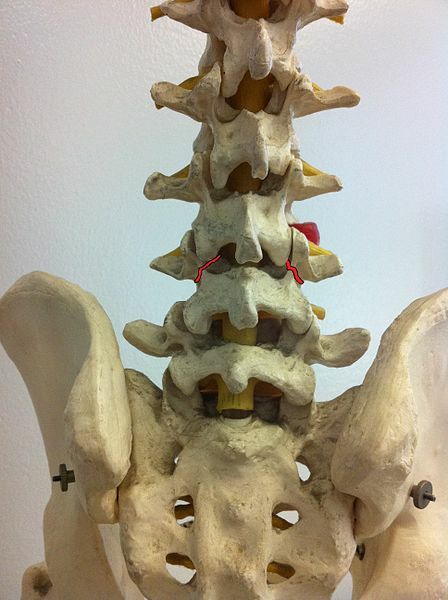 Over time, the pressure will ease off the pain caused by trigger points. You can use a trigger point ball, various cane shaped tools or the Muscle Wizard. Getting older will eventually lead to a reduction in the natural curve of your spine. This doesn’t mean you’re guaranteed to get back pain. However, this should be a wake up call to be more focused on maintaining a healthy spinal curve. To learn more about our Back Posture Wizard System, click here. We designed a system that allows a person to stretch and strengthen their back while addressing muscle knots in one simple system that can be done in minutes a day. What’s The Best Sitting Position For Proper Posture?